Along with the privilege of having full access to the AAAP’s telescopes and observatory facilities, all keyholders must participate in the AAAP’s public observing programs, and are expected to contribute to occasional maintenance and work sessions at the observatory. Each keyholder will be assigned to a public observing duty team of approximately four keyholders. Each team will have one team leader. The leader and his/her team will have full responsibility for operation of the observatory and for public interactions during the public observing sessions. Each team will serve their duty on a rotating schedule of the designated public observing nights. Keyholders unable to attend their particular duty night are requested to find a replacement for themselves by polling their fellow keyholders and switching duty nights. The current public observing schedule opens the first Friday night in April, and continues each Friday night through the end of October. The schedule is published in the SIDEREAL TIMES and on the club’s website (princetonastronomy.org). Keyholders are ambassadors of the AAAP to the public. Patience must be exercised and respect shown when responding to the various questions and situations that arise when the public is on the premises. Be prepared to direct the flow of people through the observatory and the grounds when there are large groups. Be aware of traffic and the status of parking to maintain good control. Keyholders are expected to be knowledgeable about astronomy and our equipment, and to be able to communicate basic astronomical and telescope principles to the public. Please use the opportunity to educate and entertain as appropriate for the size and age of the audience. Communicate the need for red light use in the observatory, the definition of light pollution and how homeowners can minimize light pollution by using appropriate outdoor lighting. It is suggested that the observing team agree in advance on a list of desirable objects to show the public. These should include a mix of the best Messiers plus planets and moon as appropriate. Since many people stay for only a brief period, it is advisable to rotate through a list of prime objects a few times during a night’s session. During non-public observing sessions or when conducting daytime activities at the observatory, keyholders should handle public inquiries by briefly describing the observatory and AAAP club membership benefits. Be sure to point out the current public observing schedule. Always be polite when turning away uninvited visitors, however, it is your option to provide a few observations to them if conditions allow. Keyholders, members and guests may park on the observatory grounds, as conditions allow. 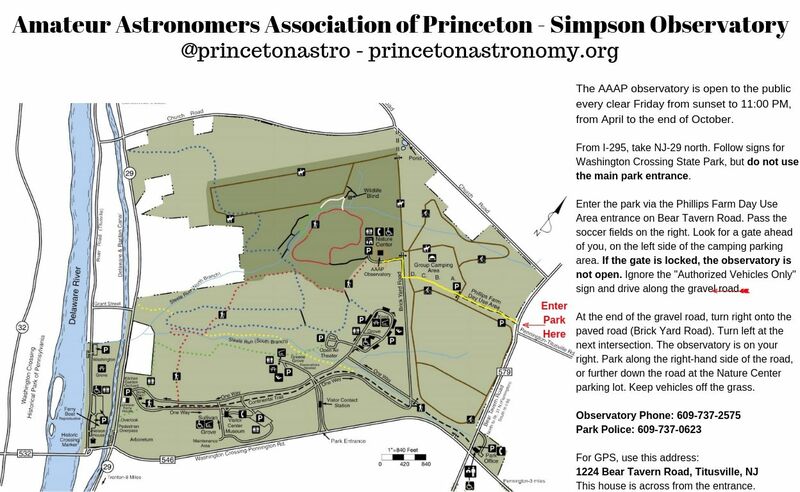 On public nights, parking on the observatory grounds is reserved for team members and AAAP members with telescopes. If a large number of AAAP members bring scopes, then the on-duty team should restrict driveway parking, allowing them to enter to unload and pack up equipment only. Care should be taken when parking on the grass in the spring and after rain events when the ground may be soft. The unlocked gate at the entrance to the observatory’s gravel driveway should remain closed to prevent the public from driving back to the observatory. Other parking for the observatory is restricted to parking along the side of the road in front of the observatory and at the nature Center parking lot. This restriction applies to all AAAP members as well as the public. When parking on park roads, park as close to the pavement edge as possible without putting wheels on the grassy shoulder. Do not block the road. When large groups of people are expected at the observatory, such as on planetarium nights, direct the public to park in the Nature Center parking lot and walk over to the observatory. These situations should be planned in advance by the duty team along with the leaders of the public groups (teachers, planetarium staff, etc). There are three, lockable gates between the park entrance at Bear Tavern Road (Rt. 579) and the observatory. Typically, only two of the three gates are locked, depending on seasonal use of the park. The first gate is at the Phillips Farm park entrance at Bear Tavern Road. The second gate is at the end of the asphalt parking area (beyond the soccer fields) near the camping area. The third gate is after the gravel road which goes past the camp sites, before returning to Brickyard Road within the park. Recent security problems in the park dictate that the following procedures be followed at all times by all keyholders. FAILURE TO FOLLOW THESE PROCEDURES WILL RESULT IN LOSS OF KEYHOLDER PRIVILEGES. Each gate, if locked, is secured in an identical fashion: a length of chain is run through the gate latch with the park’s lock on one end and the AAAP’s lock on the other end. When securing a gate it is to be locked only in this way. DO NOT ATTEMPT TO LOCK ANY GATE BY ATTACHING THE AAAP’S LOCK DIRECTLY TO THE GATE LATCH—THIS IS NOT ACCEPTABLE TO THE STATE PARK RANGERS. If a keyholder enters the park to use the observatory on any night other than a designated public night they must make note of which of the three gates were locked, and re-secure those gates in the same manner as found upon entering the park and after leaving the park. The gates must not be left open. It is also not sufficient to close the gate but leave the lock on the chain unlocked or locked with one number shifted on the lock for easy egress from the park after an observing session is finished. The gate must be locked and all of the numbers spun on the lock so that anyone who comes by cannot easily guess the combination and gain access to the park. This procedure must be applied to all locks. This procedure must be applied to all locks. It is not sufficient to lock the Bear Tavern Road/Rt. 579 gate (typically locked during the winter months) but leave the other two open, all gates must be locked. The only deviation from the above procedure is if there are campers in the park, especially in campsite D near the last gate. The campers need access to the park and therefore the first two gates must be left open. However, the last gate must always be secured on a non-public night. It is the duty of the first keyholder to enter the observatory on a given night to note the state of the gates and communicate this information to any other keyholders who arrive at the park later. If you plan to stay at the observatory later than the keyholder who first opened the observatory, make sure that you find out the status of the gates before he/she leaves. If during entry you are stopped by a park ranger or (on non-public nights, particularly off-season) by township or State police, identify yourself as a member of the AAAP Club and assure the police that you have authority from the Washington Crossing State Park to be on the premises. Always be polite if you are stopped. We realize that the above procedures will be an inconvenience to many keyholders, but they must be followed if we are to maintain the good will of the park administration. Unlock the door by unlocking both the key lock and the combination lock. Turn on the lights (switch located on your left as you enter the observatory). Disable the alarm. Make an entry in the observatory log. (The log is located on the top of the desk near the main observatory light.) Log entry is mandatory for the first keyholders to enter and the last to leave the observatory. Enter at least the date, time and the keyholder's name. Look around the observatory to see if anything is amiss (lights left on, scopes still plugged in, eyepieces not put away, etc.) and make a note of it in the log. Also check the previous few log entries to see if other keyholders noted any problems with the equipment. Roll the roof back using the hand crank near the computer room. The roof should roll back easily. During the winter months snow on the back roof can impede roof motion. If the roof appears to be very difficult to move, use the step ladder in the observatory to check the back roof for snow and ice. DO NOT APPLY EXCESSIVE FORCE TO THE GEAR CHAIN MECHANISM. Do not lean the step ladder against the edges of the roof; open the ladder and stand on it away from the observatory walls. Remove snow/ice with the push broom taking care not to damage the roof or chain. If it is too difficult to remove the snow and open the roof, then close the observatory, make a note of the problem in the log and contact the Observatory Chair. When rolling the roof back do not attempt to roll it back all the way to the end of the rails. Only roll it back about a foot beyond the back wall of the observatory. Plug in and power-up the computer and monitor dedicated for the C14 in the Computer Room. Open The Sky software. Locate eyepiece case and place on work desk. Remove lens caps from C14, finderscope, eyepiece holder and place in a safe location on the work desk. Check operation/battery power of Telrad on C14. Note dead batteries in log. Replace batteries if necessary. Check that eyepiece holder on C14 is securely attached to back of telescope. Install an eyepiece such as the 31mm Nagler in the eyepiece holder on the C14. ALWAYS PUT ONE OF THE HEAVIER EYEPIECES IN THE C14 BEFORE FIRST POWERING UP AND SLEWING THE MOUNT TO MAINTAIN PROPER BALANCE. Plug-in Paramount power cable and switch on mount. Plug in and power-up the computer and monitor dedicated for the refractor. Open The Sky software. Remove the brass lens cap from the front of the refractor. Place the gray 6" dew shield on the front of the refractor. Remove film canister from refractor diagonal. Check that eyepiece holder on the refractor is securely attached to back of telescope. Install an eyepiece such as the 55mm Plossl in the eyepiece holder. The Mallincam video camera is attached to a small refractor piggybacked on the C14 telescope. Remove the wood lens cap from the dew shield at the front of the scope. Plug in the power cord for the camera. Determine if it is operational by noting if the small cooling fans on the camera begin to spin. Plug in and turn on the monitor for the camera image. Be sure the computer for the camera is powered up and open the Mallincam Xteminator Control software. Detailed instructions for operating and shutting down the Mallincam camera can be found in the computer room. Enjoy your evening by locating and viewing a number of objects around the sky. Always warn others before slewing the telescopes. Be prepared to cancel any slew if the telescope mount makes strange noises or if it starts on a path pointing towards the ground. Slews can be cancelled from within The Sky software or by moving the joystick on the hand control. a slew manually via the hand control, return the scope to a known position and re-sync the mount in the software. Then, test for safe operation by slewing first to another near-by object. Continue viewing objects only if the software and mount have been re-synced properly. If cancelling a slew via The Sky software fails, POWER OFF MOUNT immediately to avoid damage to mount or scope. You will then need to restart the mount and software before continuing. Continue to check for secure attachment of diagonal and eyepiece throughout the session, especially when switching eyepieces. Note any irregularities of operation in log book; similarly, share any special observations or new astronomical finds in the log. Check to be sure fellow observers are clear of telescope before moving it to park position. 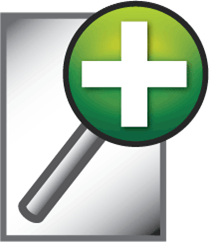 Click on an object to open the object information pop-up if necessary. Call out "Parking Telescope" and click on Park. Alternatively, you can do this from the top menu in The Sky software by selecting Telescope->Options->Park. Keep your eye on the scope until it is safely parked in a horizontal position being prepared to cancel its motion should anything go amiss. Exit from The Sky. Shutdown the computer using the shutdown menu found under "Start" in the lower left corner of the screen. Power off and unplug the computer when you see message indicating this is safe. Power off and unplug computer monitor. TURN OFF TELRAD BY PLACING TOGGLE SWITCH (THREE POSITION SWITCH) IN CENTER OFF POSITION. Remove eyepiece and return to case. If dew has formed or if it is exceptionally humid, always dry off the eyepieces using the heat gun (hair dryer) before putting into case. Cap all eyepieces, close case and return to shelf. Locate all lens caps and re-install on scope and finderscope. If it is exceptionally humid, blow hot air from heat gun into the open dew cap end of the C14 before covering for the night. Turn off and unplug the computer when you see message indicating this is safe. Power off and unplug the computer monitor. Return all eyepieces to case. Insert film canister plug in refractor diagonal. Remove 6' dew shield from front of refractor and store on shelf. Apply a stream of warm air to the front of the refractor lens for 30 to 60 seconds using the heat gun (hair dryer). Do this even if there appears to be no dew on the lens. DO NOT REPLACE BRASS DEW CAP BEFORE PERFORMING THIS DRYING PROCEDURE. Replace brass dew cap on scope. When finished using the camera, be sure to perform the camera Park (shutdown) procedure, as follows, from within the Mallincam Xterminator Control software. Click on the “Config” tab along the top menu bar. Click “Park” button in the lower left corner of the screen. Wait until a popup window appears indicating it is safe to shut down the camera and software. Call out "Slewing or Parking Telescope" and click on Park (alternatively you can do this from the menu by selecting Telescope->Options->Park from the top menu of The Sky. Close the popup window and exit software by clicking on the “X” at the top right corner of the software. Unplug the camera power supply and monitor. Replace the wood lens cap back onto the dew shield at the front of the scope. Turn off and unplug heater in computer room. Turn off audio equipment, if used, in computer room. Turn off red lights and turn on white light in observatory. Check and be sure both telescopes are parked in a safe horizontal position. Crank the roof closed watching carefully to make sure it clears BOTH telescopes. Secure all 4 turnbuckles at the corners of the observatory. Tidy up everything and secure trash cans. Remove all personal items from the observatory. Close bathroom door. Check time and note closing hour and final comments in the log. Turn off the main light switch and be sure computer room lights are off. Close computer room door and exit observatory. Lock the door to the observatory (BOTH LOCKS)! Contact Observatory Chair if you found ANY problems at the observatory. Follow the gate locking procedure when exiting the park. AAAP is eager to answer your questions about our facilities, activities and astronomy in general. Please mail us at: info@princetonastronomy.org. Openings are tweeted on Fridays, as soon as we know that the weather will cooperate.